Thinking back to my marriage vows, I remember agreeing to have and to hold, to love and to cherish for better or for worse, for richer or for poorer, in sickness and in health. Nowhere in those vows is there any mention of trust. Ay, there’s the rub, as Ralph, my Shakespeare quoting parrot might squawk. Because blindly trusting my recently and not-so-dearly-departed husband is why I now have a loan shark demanding fifty thousand dollars that I don’t have. Let me back up a bit. Until recently, my life was typically suburban middle class with two kids and two working parents. Karl worked as an auto parts sales rep, and I’m the crafts editor at a women’s magazine. Because we both worked full time, Karl and I had divvyed up the household and parental responsibilities. And because I’m totally right-brained and never met a math problem that didn’t send me into a state of hyperventilation, Karl handled the family finances. With my blessing. Karl handled the finances all right. He handled them down into negative territory so low that he’d dug us into a pit halfway to China. Only I didn’t know that. Not until he dropped dead one day. In Las Vegas. Trusting wife -- moi -- thought he was at a sales meeting in Harrisburg, PA.
Not only had Karl wiped us out -- raiding our savings, retirement accounts, and our kids’ college funds -- he’d cashed in his life insurance policy, taken a second mortgage on the house and gotten himself into hock with a loan shark. I inherited all the debt -- and the loan shark. And if that weren’t enough, someone’s framing me for a coworker’s murder. So not only do I need to clear my name and get the loan shark out of my life, I need to find some way to make extra money. That’s where Lois Winston comes in. You see, she’s telling my story in her new Anastasia Pollack Crafting Mysteries, and she’s agreed to split the advances and royalties with me. The more books she sells, the faster I climb out of debt. Lois also managed to twist a few arms and got the other editors at my magazine to blog with me at Killer Crafts & Crafty Killers. It’s the online complement to our newsstand issues and features all sorts of goodies like crafts project, recipes, decorating tips, and more. Plus, we host guest authors on what we call Book Club Friday. Stop by if you get a chance. Most of our guests give away copies of their books. You can find Killer Crafts & Crafty Killers. I blame a lot of my current predicament on my own blind trust. Had I paid more attention to family finances, I might not be where I am today. I’ve learned my lesson, though. I’ll never again trust any man, not even that to-die-for stud who’s now renting the apartment over my garage. Have you ever been suckered by someone you thought completely trustworthy? How did you handle the fallout when you discovered the truth? Award-winning author Lois Winston writes the Anastasia Pollack Crafting Mysteries. 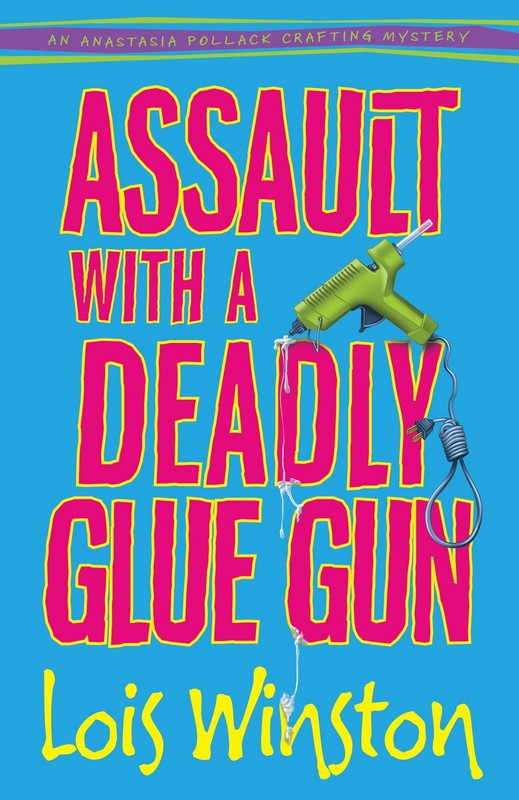 Assault With a Deadly Glue Gun debuted in January, garnering starred reviews from both Publishers Weekly and Booklist. 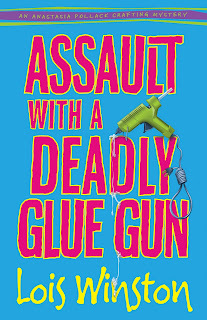 Kirkus Reviews called the book, “North Jersey’s more mature answer to Stephanie Plum.” Death By Killer Mop Doll, the second book in the series will be out in January 2012. Visit Lois at her website -- http://www.loiswinston.com -- and Anastasia at the Killer Crafts & Crafty Killers blog -- http://www.anastasiapollack.blogspot.com. You can also follow Anastasia and Lois on Twitter @anasleuth. Oh, Anastasia... sounds like quite the pickle. But don't write off the stud over the garage - LOL - you never know when you need a stud to lean on!! Only once and it will never happen again. Don't discount the stud, but just be careful and aware of your finances. Thanks, Lois! We all need to know what's going on in our family finances. This is a good wake-up call - we don't have to have been sucker punched by a loved one either to make it worthwhile. As for the stud, he sounds well worth reading about. Love your "alter ego," Lois. I think the stud is going to be trouble. Sounds like an interesting story, Anastaisa...wouldn't want to live it myself, but I'll definitely look for your book. Love the title! Thank you, Mary Jane, G.M. and Sara! Mary Jane, we should all be aware of family finances, but we all juggle so many balls that sometimes it's nice to let someone else handle some of them. That's how I got in trouble with Dead Louse of a Spouse. Working moms definitely need clones. G.M., all studs are probably trouble, but there's trouble...and then there's TROUBLE. You'll have to stick around to see exactly what kind of trouble Zack is. Sara, this was the first title I've (Lois) been able to keep. All previous books had title changes before publication, and the next book in the Anastasia Pollack Crafting Mysteries has been changed from MOP DOLL MURDERS to DEATH BY KILLER MOP DOLL. We're talking a husband here, right? Say no more! Hang onto the stud but also your finances! Does family count? Lol! Okay, not really laughing. But yes, it's happened. Fall out is hard. Wish I had a glue gun! Misa, the great thing about a glue gun is you don't need a license to wield one. Loved this story told in the voice of your character! Great idea. And, yes, I've been "loused" by a family member. And it hurts. The knife still sometimes feels like it's sticking out of my back! But onward and upward - and on to the new. Ouch! Sorry about the knife, Patti. I've found the best way of dealing with that is to cut the person off. Literally. Looks like that's your philosophy, too. Okay, I got in this time. My wife read your book and enjoyed it very much. I have a few titles which are higher (earlier) in my read-stack, but I'm eager to start yours. Thanks, Jeff. I'm so happy your wife enjoyed the book. Hope you do, too!